Please join the GSA and Graduate School for this keynote presentation by Dr. Lydia Villa-Komaroff. The presentation will be followed by a reception. Lydia Villa-Komaroff is a molecular and cellular biologist who has been an academic laboratory scientist, a university administrator, and a business woman. 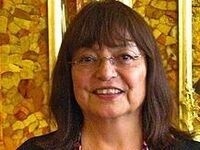 She was the third Mexican American woman in the United States to receive a doctorate degree in the sciences (1975) and is a co-founding member of The Society for the Advancement of Chicanos/Hispanics and Native Americans in Science (SACNAS). More information on Keynote speaker can be found on the SACNAS website. I'm interested with this event, where do I sign up?